Learn More About our 360 Service! 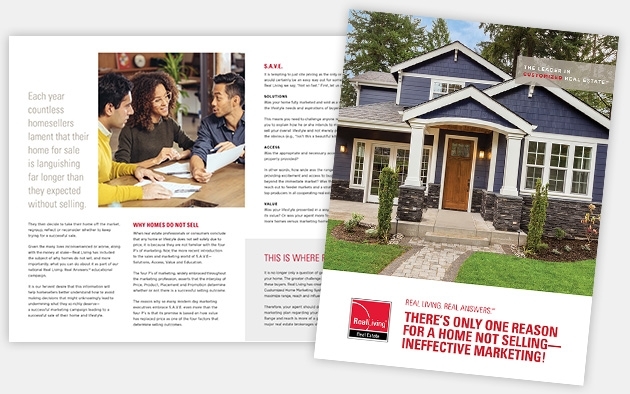 THERE’S ONLY ONE REASON FOR A HOME NOT SELLING—INEFFECTIVE MARKETING! Each year countless homesellers lament that their home for sale is languishing far longer than they expected without selling. They then decide to take their home off the market, regroup, reflect or reconsider whether to keep trying for a successful sale. Given the many lives inconvenienced or worse, along with the money at stake—Real Living has included the subject of why homes do not sell, and more importantly, what you can do about it as part of our national Real Living. Real Answers.SM educational campaign. As the Leader in Customized Real Estate, Real Living has prepared a special Real Living. Real Answers.SM guide to provide you with a more strategic approach understanding the reasons why your home didn’t sell and what Real Living can do to change that. Fill out the form on this page and we will gladly provide you with a copy. We are committed to making every real estate experience best in class. We are trained to serve as your trusted advisor, skilled negotiator and expert facilitator. We look forward to providing personalized service that helps you find dream homes that match your wish list or sell your home fast and for more. To learn more about our buyer and seller services, please contact us.